Are you looking for a certain type of Architecture? We can help you with everything. 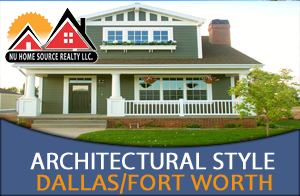 In this section you'll find links to specific types of real estate in Dallas. Bungalow Style, is an all American housing type, but it has its roots in India. In the province of Bengal, single-family homes were called bangla or bangala. British colonists adapted these one-story thatch-roofed huts to use as summer homes. Cape Cod Style, The style originated in colonial New England. Today, the term refers to Cape Cod-shaped houses popular during the 1930s, 1940s, and 1950s. Colonial Style, became a popular American house style after it appeared at the 1876 the US Centennial Exposition. Reflecting American patriotism and a desire for simplicity, the Colonial Revival house style remained popular until the mid-1950's. Cottage Style, usually a small country dwelling, but weavers' cottages are three-storied townhouses with the top floor reserved for the working quarters. Log cabin, originally came from the Swedes. The ease of construction and use of often highly available logs made them a popular choice along the frontier of America. Modern Style - Modern home designs offer clean lines, simple proportions, open plans and abundant natural light, and are descendants of the Bauhaus-influenced International style of architecture, which developed in the 1920s. Tuscany Style, A Tuscan home is warm and inviting and is inspired by the textures and colors found in nature. Color options for Tuscany decor are gold and yellow, dark green and sage, different shades of brown and ochre. These earthy tones can be found on walls, in Tuscany Furniture and rugs. These display the strong connection to nature that Italian style keeps.